We are a registered Scottish charity founded in 1995 when the Frances Colliery in Dysart closed down. We have updated our information on the Valleyfield Colliery disaster. Click on The Fife Coalfield page. 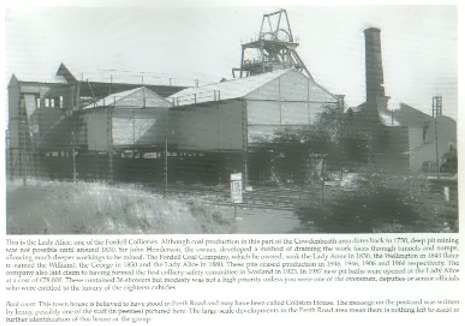 Click on disasters, scroll down to the bottom of the page and click on Valleyfield Colliery. We need the support of many to make a real success of our society so why not join?. If you are interested why not click on the CONTACT or JOIN US link below. If you have any items that have any connection with Fife Mining Heritage, including any mining memorabilia, please contact us so items can be preserved before they are lost forever. How to join the society.